Some form of waffle – batter pressed between patterned irons - has been impacting plates for more than a millennium. 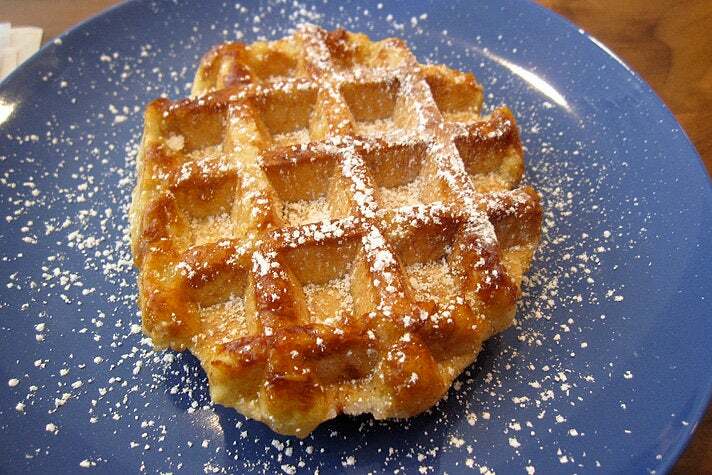 The name is a nod to the Dutch term, wafele but different spellings and styles have now proliferated across the globe. 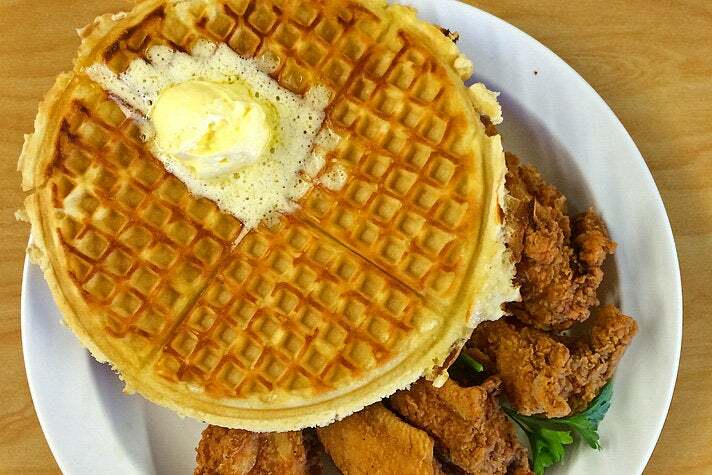 Roscoe’s Chicken & Waffles is one of L.A.'s most iconic dishes. Learn about 10 other great waffles in Los Angeles. Enjoy “breakfast for dinner” at this Hermosa Beach brewpub from Jed Sanford and Chef Tin Vuong, who are quietly taking over the South Bay. Their “dinner waffle” takes a savory turn, with two quarters of a waffle moon studded with earthy honshimeji, oyster and shiitake mushrooms. A juicy boneless fried chicken breast joins the fray. 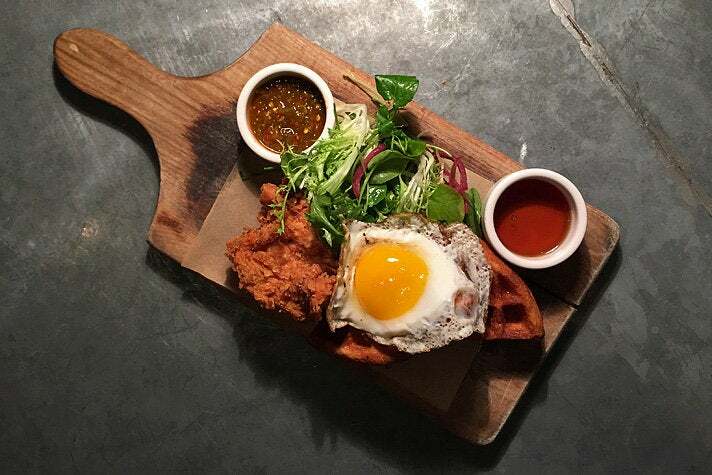 So does a runny sunny-side-up egg, frisee salad, spicy chile relish and a ramekin of sweet maple gastrique, which keeps with the chicken and waffles theme. Café Stella owner Gareth Kantner’s long awaited sequel is Dinette, an Echo Park window with worn metal tables and stools, full coffee bar and complementary comfort food. Airy buttermilk waffle slabs are available both savory and sweet. If you go down the savory path, a waffle arrives drenched in syrup and butter, topped with a slice of thick-cut Nueske’s bacon. 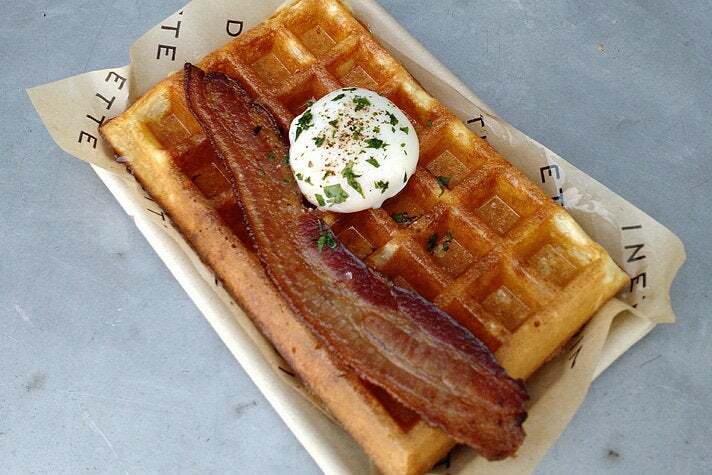 The yolk from a jiggling, well-seasoned poached egg washes over the waffle. Dinette also serves sweet versions with maple, salt and butter, or Kirsch strawberries and whipped cream. Lee and Kong Tao founded this 24/7 spot in 1981 after emigrating from Cambodia. Now daughter Mayly and older brother Sean preside over the shop, which is located in a Santa Monica strip mall and features a pink candy-stripe sign, overflowing pastry cases, tiny yellow tables and orange stools that are bolted to the floor. 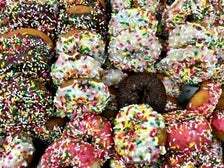 DK’s Donuts is best known for ube (purple yam) flavors and you can integrate that flavor into their Wow-Nut. 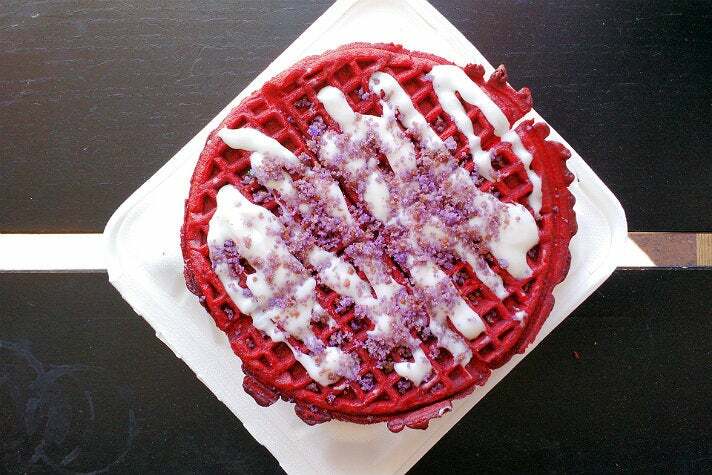 They deep-fry red velvet waffles and serve them with drizzled cream cheese frosting and ube (or red velvet) crumble. You can also order a Wow-Nut with white chocolate and crushed Oreos. 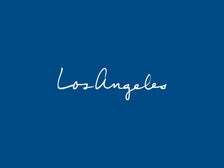 This coffeehouse and dessert shop debuted in March 2015 and is not the “Happy Days” of Richie Cunningham and Arthur Fonzarelli. Colorful arrows above the door point the way to coffee and churros. The space features a counter with a pastry case and ice cream bin fronted by white subway tiles, walls lined with lamps and mismatched plates, and wood rafters with skylights. 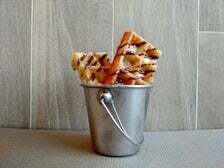 Churro waffles feature churro dough pressed in a waffle mold, coated with sugar and a hint of cinnamon. Crisp coated churros are drizzled with milk chocolate. Better yet, they're on a stick and served in a tiny silver pail. This "breakfast joint" in Bellflower from college friends Antonio Appling and chef Michael Lavery features wood tables, a peaked roof with white rafters and white walls that tout posters devoted to topics like Vegetables, Super Powers and Haircuts. 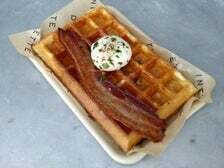 Their bacon waffle is a revelation - two thin, crisp-edged bacon-backed discs arrive topped with whiskey syrup and bacon bits. Believe it or not, this is one case where bacon isn’t over the top. Bonus: each order comes with a choice of side. We recommend griddled house-made sausage patties crafted with pork shoulder, back fat, rosemary, sage and oregano. Chef Chris Grattan grabbed the reins from Nita Millstein to helm The Peach Café, which is housed in a historic building in Old Town Monrovia. The former garage and Christian bookstore has art-lined brick walls, exposed wood rafters and an inviting patio. 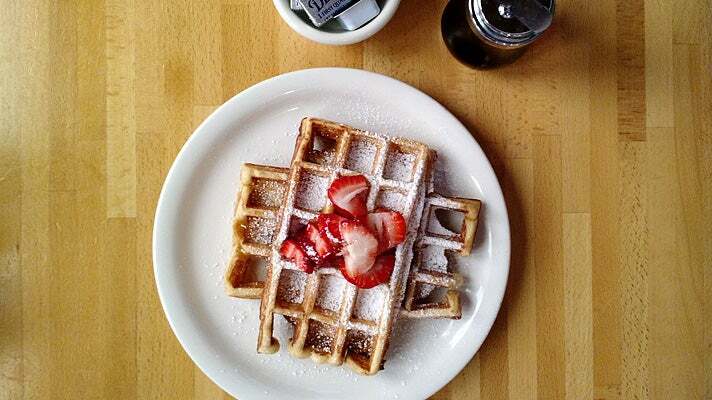 The Peach’s hickory maple waffle is a puffy rectangle studded with smoked bacon, topped with powdered sugar and strawberries and served with a tiny pitcher of maple syrup. On weekends, Grattan busts out the big guns, serving Café Benedict with hickory maple waffle topped with smoked ham, two eggs and Mornay cheese sauce. You’ll also find a classic Belgian waffle, but where’s the fun in that? 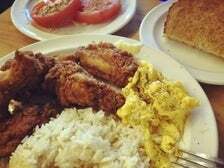 This “urban eatery” has been serving soul food in an Inglewood strip mall since 1983, a year after Harold E. Sparks relocated from Ohio and left the auto industry. Now his daughter and son-in-law run the show. 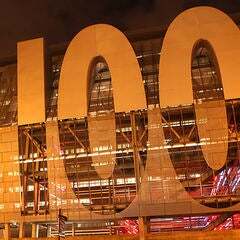 Expect comfortable booths, a social wood counter, and photo-covered walls, including Martin Luther King, Jr. The Serving Spoon features a specialized take on chicken and waffles, with only chicken wing drumettes or breast meat. Order The Cookie and receive a waffle with a soft pat of butter that melts instantly, a squeeze bottle of maple syrup and a quintet of fried chicken wing drumettes. A dusting of cinnamon is available if you like. 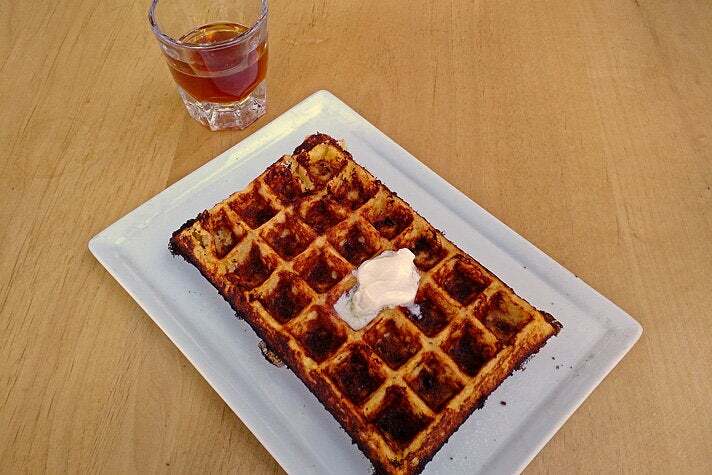 Other waffle combos include The Rambo, The Richard, and The Sparks #1, named for the local WNBA basketball squad. Shaky Alibi features vine-coated brick walls, sidewalk seats with blue umbrellas, and indoor counter seats overlooking the coffee bar. 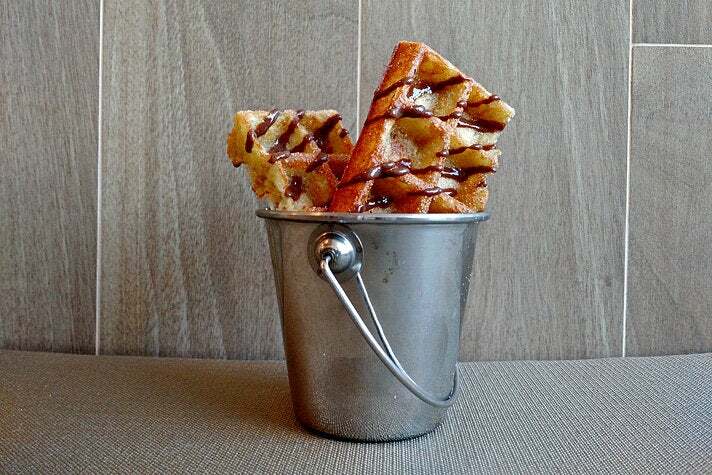 The corner café specializes in sweet and savory Liége waffle preparations, all revolving around chewy, fresh-pressed waffles studded with rocks of caramelized Belgian pearl sugar. 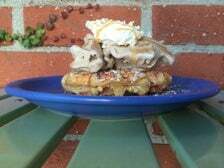 A simple Liége waffle is plenty good, though you may want to upgrade to a waffle sundae topped with McConnell’s premium ice cream, vanilla or sea salt caramel lavished with whipped cream, and either a caramel or chocolate drizzle. 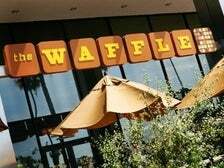 This waffle-centric restaurant is located at the base of the Comerica Bank office tower in Hollywood. The space features a high ceiling with exposed rafters, orange booths, mod patio seats with yellow umbrellas, and a waffle shaped logo. Chef Tina Lagana’s signature waffles, including red velvet, sticky bun and tres leches are all dusted with powdered sugar and available topped by strawberries, whipped cream, ice cream, chocolate chips and/or maple syrup. 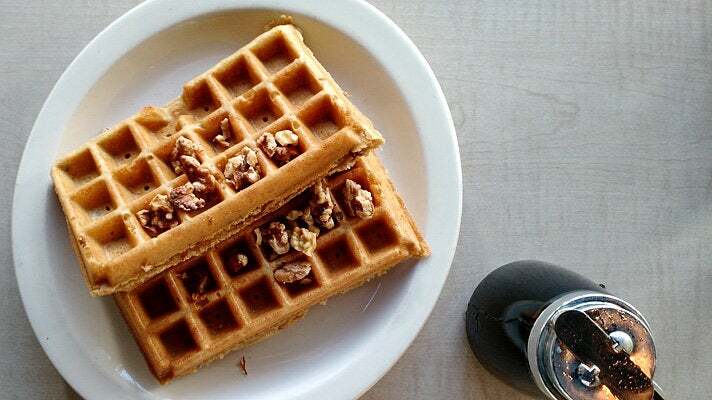 The top waffle might be the pecan waffle - twin rectangles with good give contain roasted pecans and come topped with lightly sugared pecans. Add whipped butter and maple syrup at your discretion.